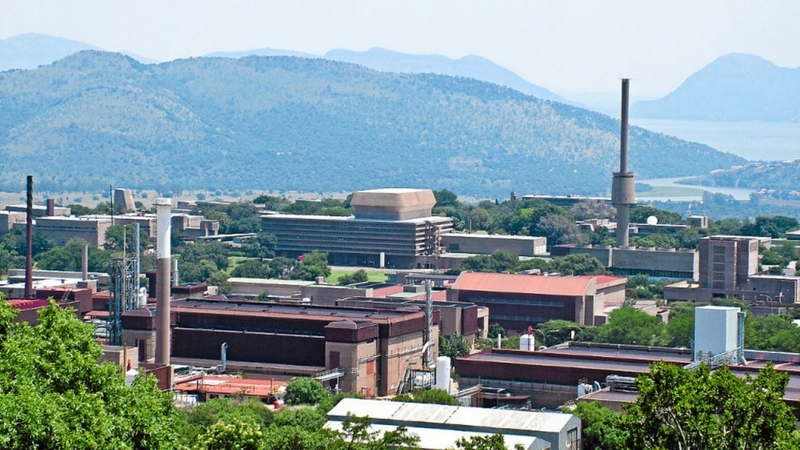 The emergence of a new era of South African fluorspar production may have been heralded by SepFluor Ltd subsidiary Nokeng Fluorspar Mine (RF) (Pty) Ltd commencing construction of its new fluorspar mine and plant, expected on stream by 2019. This represents just Phase 1 of SepFluor’s ambitions to become a world leading source of fluorspar. Another mine, and HF and AlF3 plants are also planned. Meanwhile, hard on the heels of SepFluor is SA Fluorite (Pty) Ltd with its development of the Doornhoek fluorspar deposit in North West province, expecting to secure mining rights by the end of 2018. 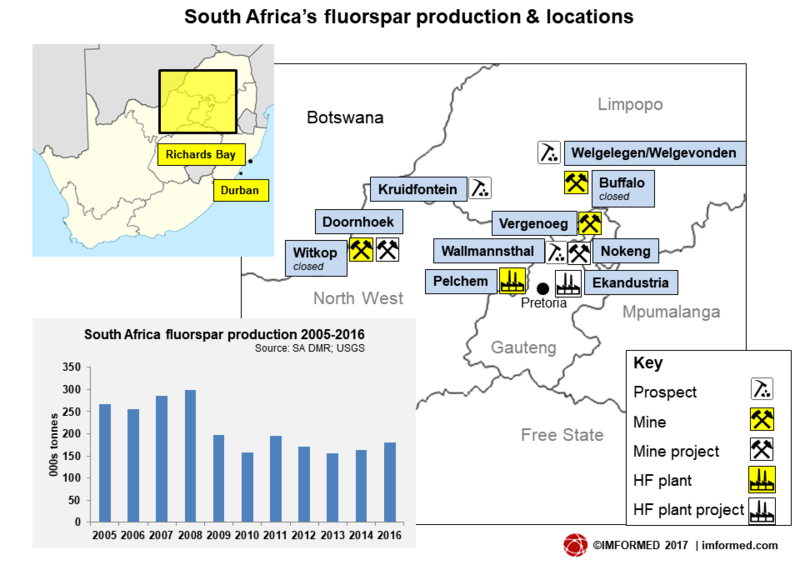 At present, while hosting the largest reserves of fluorspar in the world, South Africa has just one mine active and two others closed. These latest developments and their significance in the context of the evolving global fluorine market are just some of the key topics which will be presented and discussed at IMFORMED’s Fluorine Forum 2017, 30 Oct-2 Nov., Hilton San Luis Potosi – Early Bird Rates available for a limited time. EARLY BIRD RATES €1400 | £1200 | US$1500 BOOK NOW! SepFluor, which was unbundled from Sephaku Holdings in 2012, has been planning the Nokeng mine for at least seven years. Located at Rust de Winter, 80km north-east of Pretoria, Gauteng province, the R1.7 billion (US$131m) Nokeng open pit fluorspar mine and concentrator is planned to produce 630,000 tpa crude fluorspar ore, 180,000 tpa acid grade fluorspar (acidspar), and 30,000 tpa of metallurgical grade fluorspar (metspar). At a recent press conference SepFluor Chief Executive Officer Rob Wagner emphasised the relative size and high grade of Nokeng’s ore body (12.2m tonnes at an average of about 27% CaF2): “This is large when compared to others associated with other new fluorspar projects around the world.” said Wagner. SepFluor expects the operation “to be a leader in terms of both production volume and quality, and to rank in the bottom cost quartile globally when it reaches full production in 24 months’ time”. 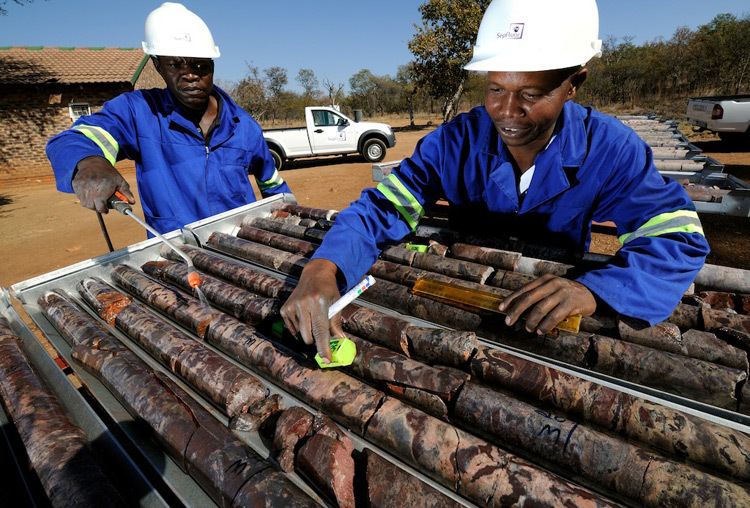 Nokeng will exploit two deposits, Plattekop and Outwash Fan, over 19 years, with the prospect of extending its mine life with a third deposit, Wilton, as yet unexplored. Construction is expected to be concluded within a 21-month period, with commissioning beginning in November 2018 and first production in January/February 2019. Chief among the Nokeng project’s perceived benefits are the ease with which Nokeng’s surface and near-surface orebody can be mined and the efficiency of its state-of-the-art concentrator. These are anticipated to help position the operation in the lower cost quartile of producers. The Department of Trade and Industry (DTI) has approved an infrastructure grant of R21 million under its Critical Infrastructure Programme (CIP), primarily as a contribution towards power supply and road works. Nokeng is expected to create around 300 fixed-term jobs during construction and 200 permanent jobs. Nokeng’s social and labour plan (SLP) has committed some R26 million. funds managed by two of AMED II’s investors, Kuramo Capital and Tribus Capital. SepFluor stated that a significant portion of early production has been pre-sold to several international fluorspar consumers who have been strongly supportive of the project and its development. A long-term agreement has been concluded with Traxys, which has a significant presence in South Africa, for the marketing and distribution of Nokeng’s production. Most recently, Traxys reinforced its position in the fluorspar trading business by acquiring CMC Cometals, the raw materials trading division of Commercial Metals Co. on 13 June 2017. CMC Cometals markets, distributes and processes a range of metals, ores, concentrates, industrial minerals, ferroalloys, chemicals and industrial products worldwide. However, one of its strongest commodities in its industrial minerals portfolio has traditionally been fluorspar. In 2012, Cometals signed an offtake agreement for acidspar produced by new player Nui Phao Mining of Vietnam. 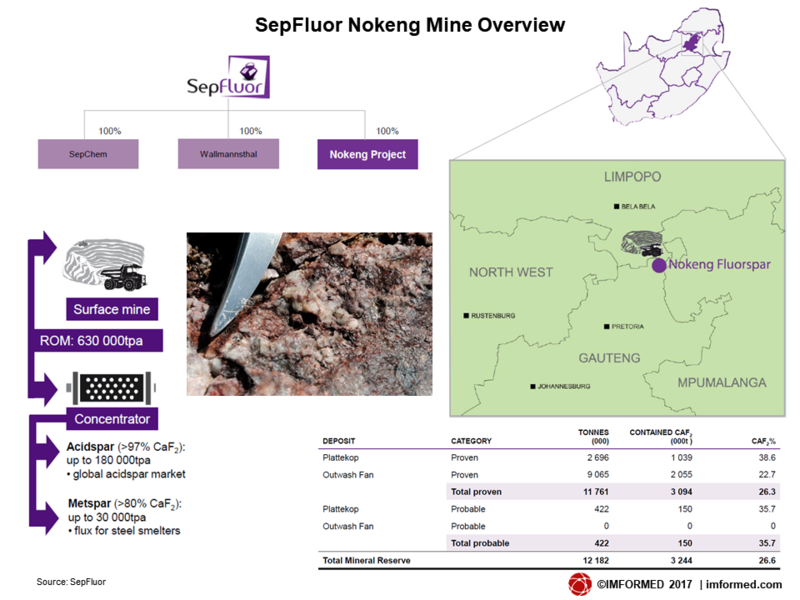 Nokeng is just Phase 1 of SepFluor’s plans to become a major force in the fluorspar market. Phase 2 envisages completion of DFS, construction, commissioning and operation of the Wallmannsthal Mine during 2018-2021; Phase 3 envisages development of a significant fluorspar resource base at Kruidfontein/Welgelegen/Welgevonden from 2020. Wallmannsthal, destined to become SepFluor’s second greenfield mining development after Nokeng, is a high grade deposit (47.7% CaF2 in situ) and has an existing resource of least 5m tonnes in the measured and indicated categories to a depth of 70m. SepFluor’s fluorochemicals plant project, SepChem, has seen advanced study and permitting completed, and financing started. SepFluor is proceeding with plans to develop a fluorochemical plant at Ekandustria near Bronkhorstspruit, some 50km from Nokeng. According to SepFluor, the region currently consumes some 30,000 tpa of aluminium fluoride (AlF3), all of which is imported. Demand for hydrogen fluoride (HF) in South Africa is estimated by SepFluor to grow by some 38,000 tpa in the medium term. The initial plans for SepChem envisaged 130,000 tpa of Nokeng’s acidspar supplying a new HF plant at Ekandustria producing 60,000 tpa high-grade anhydrous HF primarily for a new 60,000 tpa AlF3 manufacturing facility, in turn it supplying domestic and international aluminium smelters. The HF plant was also planned to produce 216,000 tpa anhydrite (CaSO4) for use in construction and fertiliser applications, while any excess HF would be available for downstream fluorochemical initiatives. Another South African fluorspar prospect that has been on the drawing board for a while is the Doornhoek Fluorspar Project being developed by SA Fluorite (Pty) Ltd and Southern Palace (Pty) Ltd, part of Eurasian Natural Resources. Located just south of Zeerust, North West province, close to the now closed Witkop fluorspar mine, the Doornhoek deposit has been drilled since 1977 but a complexity of rights, largely resolved by 2005, had historically delayed development. The mineralisation is hosted by dolomite within three stratabound horizons stretching continuously over a distance of 12km x 4km. The main horizon has an average width of 12 metres hosting high grade pods of fluorspar. “Due to the enormous size of the deposit, it has taken a lot longer to develop than smaller properties. To date we have drilled 1,836 diamond core boreholes totalling 140,000 metres.” said Allan Saad, consulting geologist, SA Fluorite. A 43-101 compliant Preliminary Economic Assessment was completed in 2013 recording 142m tonnes @ 14% CaF2 indicated resource, and 516m tonnes @ 13.8% CaF2 inferred resource (a cut-off of 5% CaF2 was used). All resources were determined from surface to a maximum depth of 90 metres and amenable to opencast mining methods. Exploration drilling is now complete, and an application has been lodged with the Department of Mineral Resources for a mining right. The mining right is expected to be issued within the next 12 months, after which mine construction will commence. In a major step forward as part of the mining right application process, detailed environmental management programme and environmental impact assessments for Doornhoek have been accepted and approved by the Department of Mineral Resources. The company is now seeking participation partners or offtake agreements. South Africa hosts some 41m tonnes of fluorspar reserves according to the USGS, accounting for 16-17% of the world total. 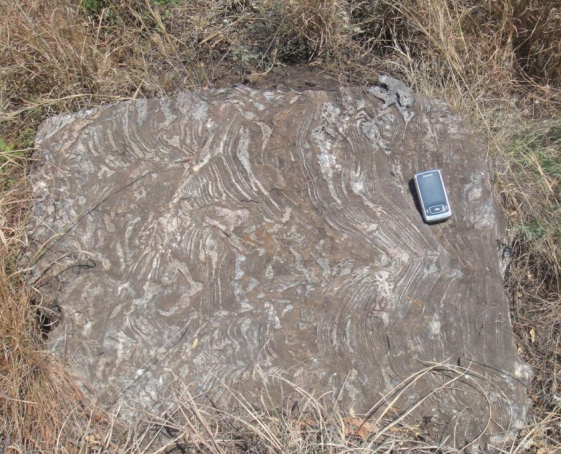 There is a distinct metallogenic fluorspar province, characterised by deposits associated with the Transvaal Supergroup, the Bushveld Complex, and post-Bushveld alkaline magmatism extending over contiguous parts of the North West, Mpumulanga, Gauteng, and Limpopo provinces. The Vergenoeg mine, in Gauteng province, is jointly owned by Spanish fluorspar producer Minerales y Productos Derivados SA (Minersa) with an 85% share and MEDU Capital (15%), and has a production capacity of 240,000 tpa. The other established fluorspar mines are Witkop, North West province and Buffalo, Limpopo province, formerly owned by Fluormin Plc (and then Vanoil Energy Ltd in 2013), and Sallies Ltd, respectively. However, owing to operational and cost pressures compounded by a decline in the price of fluorspar, Buffalo was closed in 2009 followed by Witkop in 2012, since when Vergenoeg has been the only active producer. South African production has edged back up in recent years to similar levels of 2011/2012, and was recorded at 180,000 tonnes in 2016. Exports have always accounted for most of South Africa’s output, at levels of 70-90% in well performing years, and mainly shipped to Europe and India. South Africa’s Department of Trade and Industry together with the Department of Science and Technology, Industrial Development Corp., and Pelchem SOC Ltd (subsidiary of South African Nuclear Energy Corp. Ltd (Necsa)) are all driving the Fluorochemical Expansion Initiative to develop the country’s fluorochemical industry by leveraging the country’s extensive fluorspar reserves in line with the government’s mineral processing strategy. 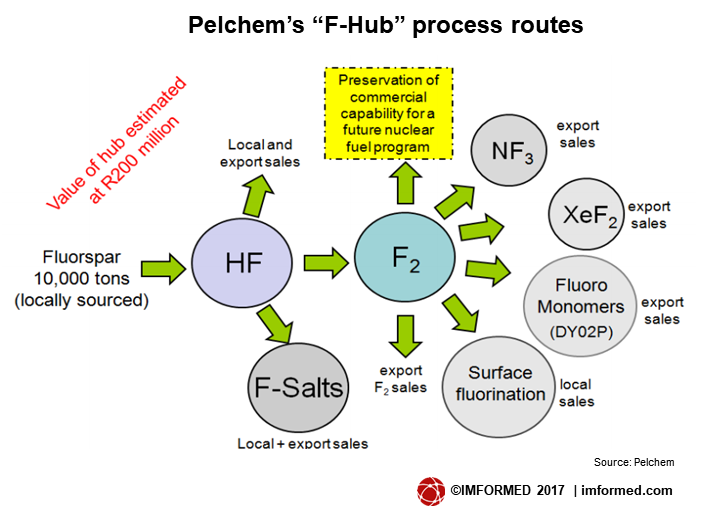 Apparently performing at full capacity, Pelchem remains the only fluorochemicals manufacturer in South Africa, with eight production facilities at the Necsa Eco-Industrial Park near Brits. Pelchem remains the only fluorochemicals manufacturer in South Africa, with eight production facilities at the Necsa Eco-Industrial Park near Brits, producing 25 fluorochemical products delivered to 27 countries. The company recently added to its portfolio molybdenum hexafluoride (MoF6) and high purity phosphorus pentafluoride (PF5), which is used to manufacture lithium hexafluorophosphate (LiPF6), the electrolyte used in most lithium-ion batteries. 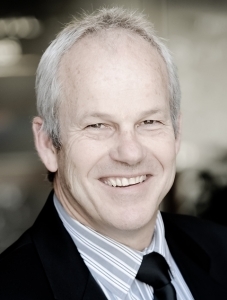 Chris Potgieter, Director, BFluor Chemicals (Pty) Ltd considers that while downstream demand for fluorspar in South Africa has been showing sporadic signs of growth in isolated areas, opportunities to initiate significant growth remain very attractive. “Getting their tails up [SepFluor on Nokeng] and allowing them to achieve the same on their SepChem project will be the start of a new era in the SA Fluorochem Industry, as this will provide the long sought-after local world scale hydrofluoric acid production capacity. This will give the necessary leverage to unlock the myriad of downstream opportunities that have been collecting in companies like BFluor.” said Potgieter. Thus the SepFluor Noking and SepChem projects, and the Doornhoek project could be very feasible given the right set of market conditions. Such conditions could include the recent loss in fluorspar production capacity not just in South Africa, but also in Namibia (Solvay’s Okorusu mine closed in 2016), Kenya (Kenya Fluorspar’s Kerio Valley mine closed in 2016), Bulgaria (Bulgaria Fluorite’s (Solvay) Chiprovtsi mine closed in 2016), and Russia (Rusal’s Yaroslav Ore Mining Co. mothballed in 2013). 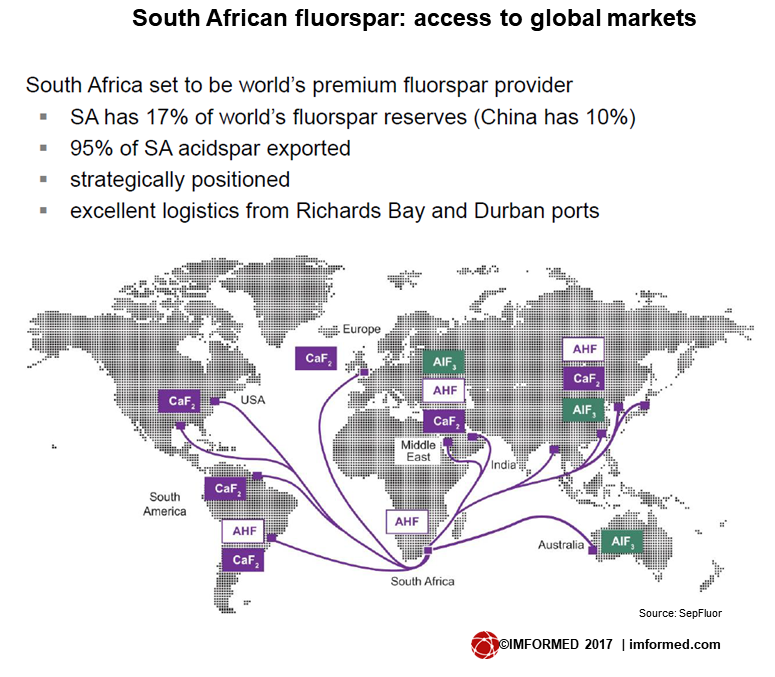 As ever, China plays a significant role in the world fluorspar industry and its influence will affect South African ambitions. Demand for Chinese fluorspar – still the world’s largest supplier – from domestic consumers is increasing as China’s fluorochemicals industry booms and there is a real possibility that China may become a net importer of fluorspar. 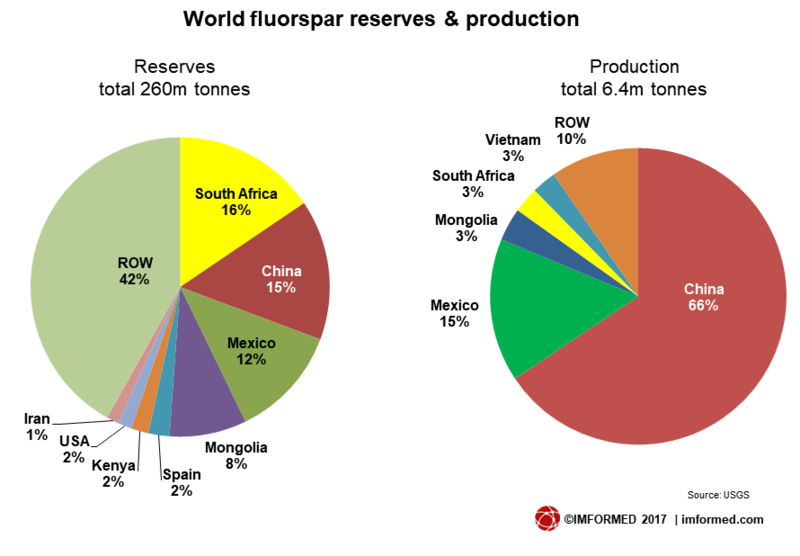 This trend of increasing fluorspar consumption within China, combined with this year’s continuing interruptions to Chinese fluorspar (and other mineral) mining from dynamite restrictions and anti-pollution controls would certainly favour development of fluorspar and fluorochemical sources outside China. Naturally, any South African newcomers would have to vie for position with other fluorspar projects in the pipeline, eg. Canada Fluorspar (Canada), Tertiary Minerals (Sweden, Norway, USA), Hastie Mining (USA). Overall, industry analysts report that the fluorochemicals market is likely receive a boost from infrastructure development in emerging economies, generating demand for refrigerants, solvents, and fluoropolymers. South Africa’s fluorspar renaissance may yet be at hand. Find out what the future holds for South Africa and the global fluorspar market at Fluorine Forum 2017, 30 Oct-2 Nov, Hilton San Luis Potosi. 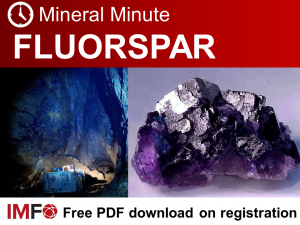 Want to know all about the fluorspar market…in just a minute? To download this FREE IMFO Presentation, please complete the form below. In doing so, you have registered with IMFORMED and agree to using this address to send future similar resources and communications relevant to industrial minerals and markets.